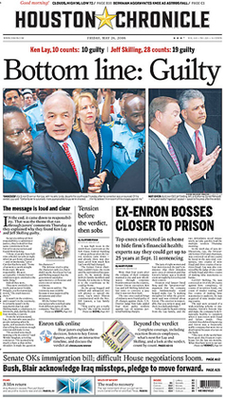 The Houston Chronicle is the largest daily newspaper in Houston, Texas, United States. As of April 2016[update], it is the third-largest newspaper by Sunday circulation in the United States, behind only the New York Times and Los Angeles Times. With its 1995 buy-out of long-time rival the Houston Post, the Chronicle became Houston's newspaper of record. The Houston Chronicle is the largest daily paper owned and operated by the Hearst Corporation, a privately held multinational corporate media conglomerate with $10 billion in revenues. The paper employs nearly 2,000 people, including approximately 300 journalists, editors, and photographers. The Chronicle has bureaus in Washington, D.C. and Austin. It reports that its web site averages 125 million page views per month. The publication serves as the "newspaper of record" of the Houston area. Previously headquartered in the Houston Chronicle Building at 801 Texas Avenue, Downtown Houston, the Houston Chronicle is now located at 4747 Southwest Freeway. It has two websites: chron.com and houstonchronicle.com. Chron.com is free and has breaking news, weather, traffic, pop culture, events listings, and city guides. Houstonchronicle.com, launched in 2012 and accessible after subscription purchase, contains analysis, reporting, columns, and everything found in the daily newspaper. Front page of the first edition of the Houston Chronicle, October 14, 1901. From its inception, the practices and policies of the Houston Chronicle were shaped by strong-willed personalities who were the publishers. The history of the newspaper can be best understood when divided into the eras of these individuals. The Houston Chronicle was founded in 1901 by a former reporter for the now-defunct Houston Post, Marcellus E. Foster. Foster, who had been covering the Spindletop oil boom for the Post, invested in Spindletop and took $30 of the return on that investment — at the time equivalent to a week's wages — and used it to fund the Chronicle. The Chronicle's first edition was published on October 14, 1901 and sold for two cents per copy, at a time when most papers sold for five cents each. At the end of its first month in operation, the Chronicle had a circulation of 4,378 — roughly one tenth of the population of Houston at the time. Within the first year of operation, the paper purchased and consolidated the Daily Herald. In 1908, Foster asked Jesse H. Jones, a local businessman and prominent builder, to construct a new office and plant for the paper, "and offered [a] half-interest in the newspaper as a down payment, with twenty years to pay the remainder. Jones agreed, and the resulting Chronicle Building was one of the finest in the South." Under Foster, the paper's circulation grew from about 7,000 in 1901 to 75,000 on weekdays and 85,000 on Sundays by 1926. Foster continued to write columns under the pen name Mefo, and drew much attention in the 1920s for his opposition to the Ku Klux Klan (KKK). He sold the rest of his interest to Jesse H. Jones on June 26, 1926 and promptly retired. In 1911, City Editor George Kepple started Goodfellows. On a Christmas Eve in 1911, Kepple passed a hat among the Chronicle's reporters to collect money to buy toys for a shoe-shine boy. Goodfellows continues today through donations made by the newspaper and its readers. It has grown into a citywide program that provides needy children between the ages of two and ten with toys during the winter holidays. In 2003, Goodfellows distributed almost 250,000 toys to more than 100,000 needy children in the Greater Houston area. Wanting to be liberal with Foster if I bought him out, since he had created the paper and originally owned most of the stock, and had made a success of it, I thought for a while before answering and finally asked him how much he owed. He replied, 'On real estate and everything about 200,000 dollars.' I then said to him that I would give him 300,000 dollars in cash, having in mind that this would pay his debts and give him 100,000 spending money. In addition, I would give him a note for 500,000 secured by a mortgage on the Chronicle Building, the note to be payable (interest and principal) at the rate of 35,000 a year for thirty-five years, which I figured was about his expectancy. I would also pay him 20,000 dollars a year as editor of the paper and 6,000 dollars a year to continue writing the daily front-page column, 'MEFO,' on the condition that either of us could cancel the editorship and/or the MEFO-column contracts on six months notice, and that, if I canceled both the column and the editorship, I would give him an additional 6,000 dollars a year for life. I considered the offer substantially more than the Chronicle was worth at the time. No sooner had I finished stating my proposition than he said, 'I will take it,' and the transaction was completed accordingly. In 1937, Jesse H. Jones transferred ownership of the paper to the newly established Houston Endowment Inc. Jones retained the title of publisher until his death in 1956. "...the Chronicle generally represented the very conservative political interests of the Houston business establishment. As such, it eschewed controversial political topics, such as integration or the impacts of rapid economic growth on life in the city. It did not perform investigative journalism. This resulted in a stodgy newspaper that failed to capture the interests of newcomers to the city. By 1959, circulation of the rival Houston Post had pulled ahead of the Chronicle." "I regard the publication of a newspaper as a distinct public trust, and one not to be treated lightly or abused for selfish purposes or to gratify selfish whims. A great daily newspaper can remain a power for good only so long as it is uninfluenced by unworthy motives, and unbought by the desire for gain. A newspaper which can be neither bought nor bullied is the greatest asset of a city or state. Naturally, a newspaper makes mistakes in judgment, as it does in type; but, so long as errors are honestly made, they are not serious when general results are considered. The success or failure of a particular issue is of little consequence compared with the all-important principle of a fearless and honest newspaper. This I intend the Chronicle shall always be, a newspaper for all the people, democratic in fact and in principle, standing for the greatest good to the greatest number, championing and defending what it believes to be right, and condemning and opposing what it believes to be wrong. Such have always been the policies of the Chronicle and to such it is now rededicated." Under Jones' watch, the Chronicle bought KTRH, one of Houston's oldest radio stations, in 1937. In 1954, Jones led a syndicate that signed on Houston's third television station, KTRK-TV. The board of Houston Endowment named John T. Jones, nephew of Jesse H. Jones, as editor of the Chronicle. Houston Endowment president, J. Howard Creekmore, was named publisher. In 1961, John T. Jones hired William P. Steven as editor. Steven had previously been editor of the Tulsa Tribune and the Minneapolis Star Tribune, and credited with turning around the declining readership of both papers. One of his innovations was the creation of a regular help column called "Watchem," where ordinary citizens could voice their complaints. The Chicago Tribune later called this column a pioneer and prototype of the modern newspaper "Action Line." Stevens' progressive political philosophy soon created conflict with the very conservative views of the Houston Endowment board, especially when he editorially supported the election of Lyndon B. Johnson, the Democratic candidate for president. But more than political philosophy was involved: Robert A. Caro revealed in his biography of Johnson that written assurance of this support from John T. Jones had been the price demanded by Johnson in January 1964 in return for approval of the merger of Houston's National Bank of Commerce, in which Jones had a financial interest, with another Houston bank, the Texas National. In 1964, the Chronicle purchased the assets of its evening newspaper competitor, the Houston Press, becoming the only evening newspaper in the city. By then, the Chronicle had a circulation of 254,000 – the largest of any paper in Texas. The Atlantic Monthly credited the growth to the changes instigated by Steven. In the summer of 1965, Jones decided to buy a local television station that was already owned by the Houston Endowment. He resigned from the Houston Endowment board to avoid a conflict of interest, though he remained as publisher of the Chronicle. On September 2, 1965, Jones made a late-night visit to the Steven home, where he broke the news that the Endowment board had ordered him to dismiss Steven. Jones had to comply. On September 3, the paper published a story announcing that Everett Collier was now the new editor. No mention was made of Steven or the Houston Endowment board. Houston Post staff wrote an article about the change, but top management killed it. Only two weekly papers in Houston mentioned it: Forward Times (which targeted the African-American community) and the Houston Tribune (an ultra conservative paper). Both papers had rather small circulations and no influence among the city's business community. The two major newspapers in Houston never mentioned Steven for many years thereafter. John J. Jones left the Chronicle not long after Steven's ouster. J. Howard Creekmore, president of the Houston Endowment, took John Jones' place at the Chronicle. Everett D. Collier replaced Steven as editor. Collier remained in this position until his retirement in 1979. J. Howard Creekmore was born in Abilene, Texas in 1905. His parents died while he was young, so he was raised by his stepmother. The family moved to Houston in 1920. Howard enrolled in Rice Institute, where he graduated with degrees in history and English. After graduation, he went to work for Jesse Jones as a bookkeeper. Jones took an interest in the young man's career, and put him through law school. Creekmore passed the bar exam in 1932 and returned to work for Jones. He held several positions in the Jones business empire. In 1959, he was named to the board of Houston Endowment, and was promoted to president of the board in 1964. By 1965, Creekmore had persuaded other directors of Houston Endowment to sell several business properties, including the Chronicle. Houston oilman John Mecom offered $85 million for the newspaper, its building, a 30 percent interest in Texas National Bank of Commerce and the historic Rice Hotel. Early in 1966, Mecom encountered problems raising the additional cash to complete the transaction. He then began lining up potential buyers for the newspaper, which included non-Houstonians such as Sam Newhouse, Otis Chandler and the Scripps-Howard organization. Creekmore strongly believed that local persons should own the paper. He insisted that Mecom pay the $84 million debt immediately in cash. Mecom cancelled his purchase agreement. In 1968, the Chronicle set a Texas newspaper circulation record. In 1981, the business pages — which up until then had been combined with sports — became its own section of the newspaper. Creekmore remained as publisher until Houston Endowment sold the paper to the Hearst Corporation. On May 1, 1987, the Hearst Corporation purchased the Houston Chronicle from Houston Endowment for $415 Million. Richard J. V. Johnson, who had joined the paper as a copy editor in 1956, and worked up to executive vice president in 1972, and president in 1973, remained as chairman and publisher until he retired April 1, 2002. He was succeeded by Jack Sweeney. In 1994, the Chronicle switched to being a morning-only paper. With the demise of the Houston Post on April 18 the next year, the Chronicle became Houston's sole major daily newspaper. On October 18, 2008, the paper endorsed Senator Barack Obama for President of the United States in the 2008 U.S. Presidential Election, the first Democrat to be endorsed by the newspaper since 1964, when it endorsed Texan Lyndon B. Johnson. It endorsed Mitt Romney in 2012, but endorsed Hillary Clinton in 2016. Locally, the Chronicle endorsed Wendy Davis for governor in 2014, and Sylvester Turner for mayor in 2015. Additionally, the Chronicle initially endorsed Jeb Bush for the 2016 Republican primary, but did not endorse any other candidate after he dropped out. On July 21, 2014 the Chronicle announced that its Downtown employees were moving to the 610 Loop campus, at the intersection of the 610 Loop and U.S. Route 59/I-69 (Southwest Freeway). The facility, previously used as the Houston Post headquarters, will have a total of seven buildings with a total of over 440,000 square feet (41,000 m2) of space. The original building is a 1970s four story "New Brutalist" building. As of 2016 the building housed the Chronicle Production Department, as well as the offices of the Spanish newspaper La Voz de Houston. Houston Chronicle headquarters in Downtown Houston before its demolition. The Houston Chronicle building in Downtown Houston was the headquarters of the Houston Chronicle. The facility included a loading dock, office space, a press room, and production areas. It had ten stories above ground and three stories below ground. The printing presses used by the newspaper spanned three stories. The presses were two stories below ground and one above. In the Downtown facility, the presses there were decommissioned in the late 2000s. The newsroom within the facility had bull-pen style offices with a few private cubicles and offices on the edges. The facility was connected to the downtown Houston tunnel system. Turner wrote that "in recent decades" 801 Texas "offered viewers an architectural visage of unadorned boxiness" and that "An accretion of five buildings made into one, it featured a maze of corridors, cul-de-sacs and steps that seemed to spring on strollers at the most unexpected times." The facility, 106 years old as of 2016[update], was originally four separate structures that were joined together to make one building. Jesse H. Jones erected the first Chronicle building, a narrow and long structure clad in granite, on the corner of Travis Street and Texas Avenue in 1910. 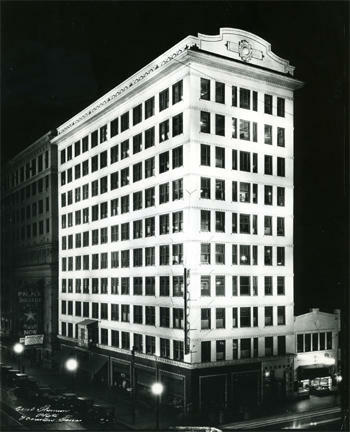 The second building, the Majestic Theater, was built west of the Chronicle building. The second building built by Jones, it opened in 1910. In 1918 the third Jones building, Milam Building, opened west of the theater. An annex was built on the north side of the main building in 1938, and that annex gained a fifth floor in the 1960s. The fifth building was a production plant built north of the original four buildings. They were joined together in a major renovation and modernisation project completed in the late 1960s. On April 25, 2017 it was imploded and reduced to rubble; today a parking lot now occupies the former site. Jack Sweeney is the publisher of the Houston Chronicle and chairman of the executive team, John McKeon is the president of the newspaper. The paper employs nearly 2,000 people, including approximately 300 journalists and bloggers. In addition, the Chronicle contracts with multiple distributors who circulate and deliver copies of the newspaper. John H. Murphy was a longtime Chronicle officer. He was the assistant to Richard Johnson, a former executive vice president of the Texas Daily Newspaper Association, and a newspaperman, mostly in Houston, for seventy-four years. 2000: Houston's M. D. Anderson Cancer Center gave the Chronicle its Joseph T. Ainsworth Volunteer Community Award for making the newspaper available at a "greatly reduced rate" to the hospital and its patients. 2002: Holocaust Museum Houston awarded the Chronicle its "Guardian of the Human spirit" award. The presenter, Janis Goldstein, said the award was given "because the Houston Chronicle embraces the causes most dear to it with a depth and scope that goes well beyond what is expected." Also, that "the Chronicle gives of itself to build a community that will embrace tolerance, understanding, and diversity and will speak out against prejudice and unfairness of any kind." 1963: William Porterfield won an Ernie Pyle Award. 1989–1997: Carlos Antonio Rios, a Chronicle photographer since 1978, has repeatedly been honored for his photojournalism by the National Association of Hispanic Journalists. 2003: James Howard Gibbons received third place in the "Hearst Distinguished Journalism Awards," an internal contest held between Hearst's newspapers, for his editorial piece When Will the U.S. Liberate Texas? 2005: Then-White House correspondent Julie Mason was voted by readers of Wonkette (a Washington, D.C. political blog) the tongue-in-cheek "Best to Sit Next to on the Bus (for more than 20 minutes)." (Mason later left the newspaper for the Washington Examiner. She now hosts The Press Pool on the POTUS Channel on SiriusXM). Leon Hale, a long-time columnist and author of 11 books, recently received the Lon Tinkle Award for Excellence Sustained Throughout a Career from the Texas Institute of Letters, of which Hale is member. 2015: Pulitzer Prize for Commentary. Lisa Falkenberg — 2015 winner for commentary. "For vividly-written, groundbreaking columns about grand jury abuses that led to a wrongful conviction and uncovered other egregious problems in the legal and immigration systems." Dudley Althaus – 1992 finalist in international reporting: "For his articles on the causes of the cholera epidemic in Peru and Mexico." Tony Freemantle – 1997 finalist in international reporting: "For his reporting from Rwanda, South Africa, El Salvador and Guatemala on why crimes against humanity go unstopped and unpunished." Nick Anderson – 2007 finalist for editorial cartooning: "For his pungent cartoons on an array of issues, and for his bold use of animation." Anderson won the Pulitzer in 2005 when working for The Courier-Journal, Louisville, Ky.
Staff – 2009 finalist for breaking news coverage: "For taking full advantage of online technology and its newsroom expertise to become a lifeline to the city when Hurricane Ike struck, providing vital minute-by-minute updates on the storm, its flood surge and its aftermath." Staff - 2017 finalist for public service. "For exposing the grave injustice of arbitrary cost-cutting by the State of Texas that denied tutoring, counseling and other vital special education services to families, hindering the futures of tens of thousands of children. In September 2018, then-executive editor Nancy Barnes released a statement on the Chronicle's website notifying readers for the first time that the paper's Austin Bureau Chief, Mike Ward, had resigned and was the subject of an internal investigation after questions were raised by a staff member over fabricating sources. At the time, Barnes said in her statement: "As a journalism organization, we owe the public more. We owe our readers the truth and to tell you if, in fact, there were inaccuracies in anything we published. We simply do not know the full story yet." The sources being questioned in Ward's reporting were the product of "man-on-the-street" interviews from a story dealing with rebuilding efforts following Hurricane Harvey. Barnes said Houston Chronicle researchers had problems finding a number of sources quoted in Ward's story, so the newspaper hired investigative journalist David Wood, a Pulitzer Prize winner, to look into the situation. "The review included 744 stories, from early August 2018 back to January 2014, when he was hired after a long career at the Austin American-Statesman. A team of three pulled out the names of 275 individuals who were presented as ordinary Texans and made every effort to find them. Of the 275 people quoted, 122, or 44 percent, could not be found. Those 122 people appeared in 72 stories". Barnes later went on to tell Columbia Journalism Review "that the widespread fabrication apparent in Ward’s articles was unprecedented, in her experience. I’ve been an editor a long time and I have never seen anything like this, period." In the aftermath, three veteran editors at the Houston Chronicle who were responsible for editing Ward's copy quickly distanced themselves from any responsibility involved in making sure one of their reporter's was being honest to readers, including former Managing Editor Vernon Loeb. Loeb, who worked directly with Ward on a near-daily basis to frame, edit, discuss sources and even rewrite stories, said: "I don't believe Mike Ward was the kind of journalist who would make people up." The Houston Chronicle did not publicly announce whether it was taking internal measures to address a newsroom culture that led to a major breach of trust with its readers. Ward, a veteran and award-winning journalist, was the first reporter hired by Barnes and Loeb to work in the combined Hearst Newspapers Austin Bureau, which includes the Houston Chronicle and San Antonio Express-News. As such, he was of the paper's top political writers, appearing on television and on radio representing the newspaper, co-hosting a weekly podcast and managing several Chronicle reporters in the bureau. At the time, the Hearst Austin Bureau had historically maintained only one bureau chief in Austin, but Barnes and Loeb installed Ward as a second bureau chief, helping create a culture of division and internal competition between the two newspapers that permeated Hearst's Austin operation. The Houston Chronicle almost got scooped on the news about one of its own faking sources, a potential PR nightmare for a news organization.Barnes did not disclose to the public that the paper was looking into one of its own over allegations of creating fake sources until the situation had already become well-known gossip in Austin circles around the state Capitol, including among staffers and competing media publications, and only after fielding an inquiry from at least one reporter working on a story about the situation. Shortly after getting a call from a freelance reporter, Barnes issued a statement addressing the sudden resignation and investigation of the paper's Austin bureau chief. A copy of the original story that led to the investigation has been removed from the Chronicle's website. But Austin-based NPR affiliate, KUT, interviewed Ward for the radio in the days after the story ran. Ward was quoted on air responding to questions, and the radio station published a short piece online summarizing Ward's finding from his now-retracted story. That story is still on KUT's website. the "local" sections are no longer published on Thursdays. In the weeks following the September 11, 2001 attacks the Houston Chronicle published a series of opinion articles by University of Texas journalism professor Robert Jensen that asserted the United States was "just as guilty" as the hijackers in committing acts of violence and compared that attack with the history of U.S. attacks on civilians in other countries. The opinion piece resulted in hundreds of angry letters to the editor and reportedly over 4,000 angry responses to Jensen. Among them were claims of insensitivity against the newspaper and of giving an unduly large audience to a position characterized as being extremist. University of Texas president Larry Faulkner issued a response denouncing Jenson's as "a fountain of undiluted foolishness on issues of public policy", noting "[h]e is not speaking in the University's name and may not speak in its name." The Chronicle printed four subsequent opinion articles by Jensen, asserting his case. Jensen is also a regular guest writer on the opinion page and has published several dozen opinion articles on other subjects in the Chronicle. In April 2004 the Houston Chronicle began carrying a Spanish-language supplement, the entertainment magazine La Vibra. La Vibra caters to speakers of Spanish and bilingual English-Spanish speakers, and is mainly distributed in Hispanic neighborhoods. In December 2004 the Chronicle acquired the Spanish-language newspaper La Voz de Houston. In late 2002, Chronicle website managers accidentally posted an internal memorandum on its web site. The memorandum outlined a draft agenda of coordinated news articles, editorials, and op-eds seemingly intended to promote a referendum to expand Houston's controversial METRORail system on the 2003 ballot. It proposed several "investigative" news stories and editorials designed to examine "the campaign led by Tom DeLay and Bob Lanier to defeat rail expansion." DeLay, a Houston congressman, and Lanier, a former mayor of Houston, had both actively opposed light rail in the past. The document was online for only an hour, but long enough to be viewed by some readers. Soon after, the Houston Review, a conservative newspaper published by students at the University of Houston, printed the memo's full text and an accompanying commentary that criticized the paper. The Chronicle's response was initially muted. Its first official response appeared in the "corrections" section later the same week stating: "An internal Houston Chronicle document was mistakenly posted to the editorial/opinion area of the Web site early Thursday morning. We apologize for any confusion it may have caused." Chronicle editor Jeff Cohen, who gave a statement in defense of the memorandum: "I make no apologies for having a thorough discussion of the issue. We have nothing to apologize for…There was an inadvertent posting of it to the Web site, and I'm sorry about that, but I make no apologies for the contents of it." As the bond referendum approached, the Houston Chronicle requested that Texans for True Mobility (TTM), the main critic of METRORail, provide the paper with a copy of their financial contributor reports. TTM declined, saying they did not believe the Chronicle would adequately protect the privacy of their donors. The Chronicle responded by making a complaint to the Harris County District Attorney's office asking that Texans for True Mobility be investigated for potential violations of Texas election law. The Chronicle alleged that TTM broke a law requiring PACs to disclose their donors. TTM said that their status as a registered non-profit 501(c)(6) organization, as opposed to a PAC, did not require them to do so. The Chronicle argued that the law covered TTM because it made "paid political moves." Texas campaign law allows nonprofits to run "educational" advertisements, but those advertisements cannot endorse specific political positions or people or make a specific recommendation in a pending election. The dispute was over whether TTM's advertisements, and specifically the slogans "Metro's Rail Plan Costs Too Much ... Does Too Little" and "Metro's Plan Won't Work Here," were specific recommendations on how to vote. Harris County District Attorney Rosenthal later dismissed the Chronicle's complaint, finding it without merit on the grounds that the statute did not apply. Rosenthal's involvement in the probe itself came under fire by the Houston Press, which in editorials questioned whether Rosenthal was too close to TTM: from 2000 to 2004, Rosenthal accepted some $30,000 in donations from known TTM supporters. Later that year, TTM revealed that their television and radio ads were funded by $30,000 in contributions made the day before the election by two PACs controlled by DeLay. In early 2004, Chronicle reporter Lucas Wall interviewed the family of Leroy Sandoval, a Marine from Houston who was killed in Iraq. After the article appeared, Sandoval's stepfather and sister called into Houston talk radio station KSEV and said that a sentence alleging "President Bush's failure to find weapons of mass destruction" in Iraq misrepresented their views on the war and President George W. Bush, that Wall had pressured them for a quotation that criticized Bush, and that the line alleging Bush's "failure" was included against the wishes of the family. A dispute ensued between KSEV radio show host/owner Dan Patrick and an assistant managing editor at the Chronicle. The incident prompted Patrick to join the call for a boycott of the paper. The story was also picked up by the local Houston television stations and, a week later, the O'Reilly Factor. Eventually, Chronicle publisher Jack Sweeney contacted the Sandoval family to apologize. On April 18, 1995, the Houston Post ceased operations, leaving the Chronicle as Houston's only major daily newspaper, and the Hearst Corporation purchased some of the Post's assets. Houston Chronicle announced it in a way that suggested the shutdown and Hearst's purchase of the Post's assets were simultaneous events. "Post closes; Hearst buys assets," the Chronicle headline read the day after the Post was shut. Internal memos obtained via FOIA from the Justice Department antitrust attorneys who investigated the closing of the Houston Post said the Chronicle's parent organization struck a deal to buy the Post six months before it closed. The memos, first obtained by the alternative paper the Houston Press, say the Chronicle's conglomerate and the Post "reached an agreement in October, 1994, for the sale of Houston Post Co.'s assets for approximately $120 million." In January 2006 the Chronicle hired Richard Murray of the University of Houston to conduct an election survey in the district of U.S. Rep. Tom DeLay, in light of his 2005 indictment by District Attorney Ronnie Earle for alleged campaign money violations. The Chronicle said that its poll showed "severely eroded support for U.S. Rep Tom DeLay in his district, most notably among Republicans who have voted for him before." Former Texas Secretary of State Jack Rains contacted the Chronicle's James Howard Gibbons, alleging that the poll appeared to incorrectly count non-Republican Primary voters in its sample. Rains also asserted that Murray had a conflict of interest in the poll, as Murray's son Keir was a political consultant working for Nick Lampson, DeLay's Democratic challenger in 2006. In response, Gibbons denied the methodological flaws in the poll. Some Houston Post articles had been made available in the archives of the Houston Chronicle website, but by 2005 they were removed. The Houston Chronicle online editor Mike Read said that the Houston Chronicle decided to remove Houston Post articles from the website after the 2001 United States Supreme Court New York Times Co. v. Tasini decision; the newspaper originally planned to filter articles not allowed by the decision and to post articles that were not prohibited by the decision. The Houston Chronicle decided not to post or re-post any more Houston Post articles because of difficulties in complying with the New York Times Co. v. Tasini decision with the resources that were available to the newspaper. People interested in reading Houston Post articles may view them on microfilm. The Houston Public Library has the newspaper on microfilm from 1880–1995 and the Houston Post Index from 1976 to 1994. The microfilm of 1880–1900 is in the Texas and Local History Department of the Julia Ideson Building, while 1900–1995 is in the Jesse H. Jones Building, the main building of the Central Library. In addition, the M.D. Anderson Library at the University of Houston has the Houston Post available on microfilm from 1880–1995 and the Houston Post Index from 1976 to 1979 and from 1987 to 1994. ^ "Hearst Communications Inc.: Houston Chronicle". Retrieved January 9, 2019. ^ "Web Services". Houston Chronicle. Retrieved January 25, 2017. ^ Stolzenberg, Lisa and Stewart J. D'Alessio (criminal justice professors from Florida International University School of Policy and Management). "Capital punishment, execution publicity and murder in Houston, Texas." (Archive). Journal of Criminal Law and Criminology. Northwestern University School of Law, January 1, 2004. Volume 94, Issue 2 (Winter), Article 4. Retrieved on May 15, 2015. Posted by Gale Group/Cengage Learning. p. 351-380. Available at JSTOR. Available at Thefreelibrary. CITED: p. 364. "The Houston Chronicle is the newspaper of record for Houston and has the largest circulation of any daily newspaper in the city." ^ "Houston Chronicle." Hearst Corporation. Retrieved on February 7, 2016. "4747 Southwest Fwy. Houston, Tx 77027"
^ O'Laughlin, John (November 18, 2012). "Letter to our readers announcing HoustonChronicle.com". Chron. Retrieved December 22, 2018. ^ a b c d The Handbook of Texas Online. Houston Chronicle. Retrieved December 2, 2009. ^ Timmons, Bascom Nolly (1956). Jesse H. Jones, the Man and the Statesman. London: Greenwood Press. p. 77. ISBN 978-0-8371-7925-4. ^ Handbook of Texas Online. "Foster, Marcellus Elliot (1870–1942)". Retrieved March 26, 2010. ^ Gonzales, J. R. "Another way to get your news from the Chronicle." Houston Chronicle. October 14, 2008. Retrieved May 26, 2010. The image is not from the J. R. Gonzalez article, but the picture in the Gonzales article depicts the same building that is seen in the illustration. ^ Heise, Kenan. "W.P. Steven, Ex-newspaper Executive." Chicago Tribune. August 11, 1991. Retrieved October 5, 2011. ^ Caro 2012, pp. 523–527. ^ a b c d Bagdikian, Ben H. theatlantic.com "Houston's Shackled Press". Atlantic Monthly. August 1966. Retrieved March 25, 2010. ^ Ackerman, Todd. "At the helm: Chronicle publishers." Houston Chronicle. October 12, 2001. Retrieved May 11, 2010. ^ Time. “Newspapers: A Deal Done In” June 17, 1966. time.com Retrieved May 10, 2010. ^ Houston Chronicle Archives, "Houston Chronicle purchase completed by Hearst Corp." May 1, 1987. ^ "Richard J.V. Johnson: September 22, 1930 – January 14, 2006". American Advertising Federation Houston. January 19, 2006. Retrieved December 2, 2009. ^ "The presidential ticket". Houston Chronicle. October 18, 2008. Retrieved July 26, 2010. ^ Dunham, Richard (October 19, 2008). "Houston Chronicle endorses Obama over McCain – the first time the Chron has picked a Democrat since LBJ in 1964". Houston Chronicle blog. Retrieved July 26, 2010. ^ "Romney for president". Houston Chronicle. October 21, 2012. Retrieved July 30, 2016. ^ "These are unsettling times that require a steady hand". Houston Chronicle. July 29, 2016. Retrieved July 30, 2016. ^ Caruba, Lauren (November 4, 2014). "A Handy Guide to the Major Texas Newspaper Endorsements". Texas Monthly. Retrieved July 30, 2016. ^ "Sylvester Turner for mayor". Houston Chronicle. October 11, 2015. Retrieved October 11, 2015. ^ "For Bush". Houston Chronicle. February 12, 2016. Retrieved July 30, 2016. ^ "2016 Texas Primary Endorsements". Houston Chronicle. February 29, 2016. Retrieved July 30, 2016. ^ Pulsinelli, Olivia (July 21, 2014). "Houston Chronicle to move downtown employees to Southwest Freeway facility". Houston Business Journal. Retrieved February 26, 2016. ^ a b c Moreno, Jenalia (December 3, 2004). "Chronicle buys La Voz Spanish newspaper". Houston Chronicle. Retrieved January 8, 2012. ^ a b c d Turner, Allan (February 13, 2016). "The Chronicle leaves the ghosts behind at 801 Texas". Houston Chronicle. Retrieved February 26, 2016. "The new complex, formerly the home of the Houston Post, will provide more than 440,000 square feet in seven buildings.[... ]The plant at 4747 Southwest Freeway was acquired after the Post closed in 1995, and has for a number of years been the site of the Chronicle's production departments. ^ "HOUSTON CHRONICLE." Hearst Corporation. Retrieved May 5, 2013. "801 Texas Avenue Houston, TX 77002"
^ "Chronicle Building". Houston Chronicle Tour. Houston Chronicle, Inc. Archived from the original on February 3, 2008. Retrieved January 27, 2011. ^ Hlavaty, Craig (April 25, 2017). "The old Houston Chronicle building is officially gone". Houston Chronicle. Retrieved August 16, 2017. ^ "David Wood of The Huffington Post". Pulitzer. ^ "A note from the editor of the Houston Chronicle". Houston Chronicle. ^ "Broken trust at the Houston Chronicle". Columbia Journalism Review. ^ "Former Statesman reporter suspected of fabricating sources at Houston paper". Austin American Statesman. ^ "For Most Affected By Harvey, Anger At Government Has Subsided". KUT. ^ Jensen, Robert. "Four months later, no regrets for writing against U.S. policy." Houston Chronicle. January 20, 2002. Retrieved January 8, 2012. ^ Connelly, Richard. "Trainspotting." Houston Press. September 11, 2003. Retrieved October 20, 2011. ^ a b Abrahams, Tom. "Radio talk show host launches boycott against local newspaper." KTRK-TV. April 4, 2004. Retrieved October 20, 2011. ^ Mack, Kristen. "Troubles erode support for DeLay in 22nd District." Houston Chronicle. January 14, 2006. Retrieved October 20, 2011. ^ a b Newkirk, Jim. "Houston Post archives permanently unavailable online, maybe, likely, really..." Houston Chronicle. July 1, 2005. Retrieved July 3, 2010. Caro, Robert A. (2012). The Passage of Power: The Years of Lyndon Johnson, Vol. IV. New York City: Alfred A. Knopf. pp. 523–527. ISBN 978-0-679-40507-8. Wikimedia Commons has media related to Houston Chronicle.